The Scoop: National Day of Unplugging inspires people to take a 24-hour break from technology. That means no laptops, no computers, no tablets, and — most of all — no cellphones. The idea isn’t punitive; rather that people are often too distracted by technology to focus on those around them — including their partners. National Day of Unplugging encourages people, couples, and families to pay more attention to each other and participate in low-tech activities, including sports, art, and reading. 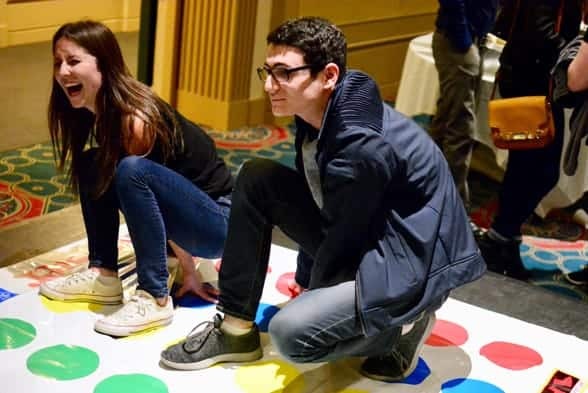 The day is the brainchild of Reboot, a nonprofit that aims to rekindle connections in 21st-century Jewish communities. You wake up to the sound of the alarm on your cellphone in the morning, so you decide to hit the snooze button to get a few more precious minutes of sleep. When you finally get up for good, you scroll around on your phone for the latest posts on Instagram, Facebook, and Twitter. Meanwhile, your partner looks at his or her phone next to you in bed. The one thing you’ve missed in this morning routine? Connecting with each other. This scenario is all-too-familiar for many couples, even those who have strong relationships. By modernizing traditional Jewish traditions for contemporary society, Reboot aims to encourage people to stop staring at their phones. With this goal in mind, the organization developed National Day of Unplugging, a 24-hour event based on the Jewish Shabbat. “Shabbat is the day of rest, but what often keeps us from relaxing and reconnecting with people around us are our phones,” Tanya said. 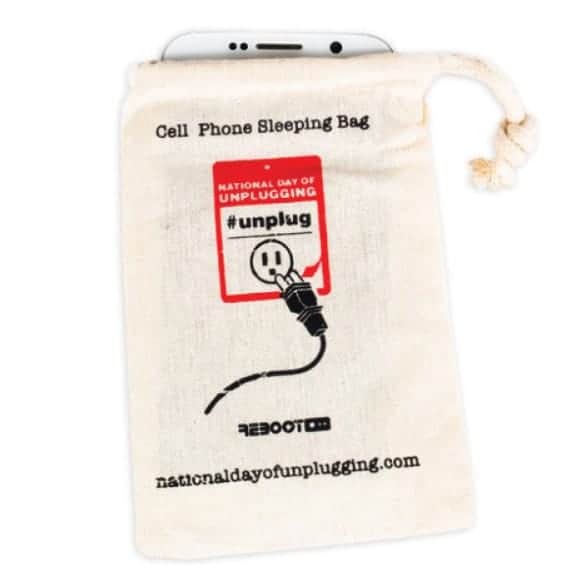 Many National Day of Unplugging participants place their devices in cellphone sleeping bags provided by Reboot. Though it’s based on a Jewish day of rest, National Day of Unplugging is for everyone. In 2019, it will be held from sundown on March 1 to sundown on March 2, during which time tens of thousands of participants will disconnect from their phones and other technology. Last year, about 35,000 of those unplugging even put their devices into special sleeping bags, meaning they can’t even look at them. National Day of Unplugging provides a break from technology that inspires couples to connect — and make more time for each other in the future. National Day of Unplugging can be a revelation for tech-addicted couples. Today, it’s common to see couples together at restaurants or events but not mentally present because one or both is surfing the web. “They’re with their other friends, or they’re exploring the world, but they’re not really present in the moment,” Tanya said. Tanya said that, in her own marriage, her husband spends more time on his phone than she would like. “I say to my husband, ‘What are you doing? I want to spend time with you,’” she said. Statistics support the idea that smartphones are ever-present in our lives. A survey from the Pew Research Center found that 89% of respondents used their smartphones during recent social gatherings. Participants at Reboot’s tech-free events connect with each other in fun environments. To support the idea that people don’t need to spend so much time on their devices, Reboot put on more than 900 low-tech events attracting over 65,000 participants in 2018 alone. Attendees agree that they won’t use their phones at the events, and, instead, will participate in activities and meet other people. Some of the activities included adult crafts, board games, and puzzles. One event participant, Annie Tannous, said it brought her and her husband closer together. The events also highlight the fact that many people act disinterested in meeting others when they’re out alone. Instead, they use their phones as a defense mechanism, even if they’re sitting alone at a bar wanting desperately to meet a special someone. But staring at a cellphone makes it more difficult to make connections, and it becomes a cycle. “It’s important in any relationship — husband, wife, friends, family — to put down the phone when we’re with each other and live in the moment. We are so distracted by the screen that we miss everything that’s going on around us,” Annie said. While Reboot events aren’t explicitly designed to help singles find dates, the fun atmosphere and increased openness often lead to participants finding romance. National Day of Unplugging was inspired during a tech-free Shabbat by a participant named Dan at a Reboot conference. As the group gathered to watch the sunset over the mountains, Dan realized that he had never spent this much time away from his phone. Couples who participate in National Day of Unplugging are encouraged to play games or do art projects together. That constant connectedness in all aspects of life is, according to Reboot, eroding many personal and romantic relationships. For one, people don’t know how to be vulnerable anymore; if they’re uncomfortable in a situation, they whip out their smartphones and disconnect. They also lose conversational skills developed through interactions, not innate. Tanya describes her son’s high school carpool. When she drives, Tanya never lets any of the kids use their phones, which is uncommon for them. But the results of the no-smartphones-allowed carpool are compelling. While it may not be surprising that today’s teens are addicted to their phones, adults and couples have a similar difficulty in disconnecting. Developing healthy screen-time habits isn’t easy. According to the Center for Humane Technology, users aren’t just addicted to their phones, these technologies have been developed specifically to addict them. While National Day of Unplugging lasts for only 24 hours, Reboot understands that a single day without technology won’t radically change anybody’s life. Instead, it’s a way to help people experience the joy in life without the constant need to be checking your phone. Tanya said she hopes that the events inspire couples to be more present with friends, family, and each other. After the event, Reboot encourages individuals to develop technology goals. For example, one couple may choose to turn off their phones during dinner every night. Another may decide to power down for a glass of wine with each other every afternoon. That doesn’t just mean turning the smartphone screen down on the table, either. Even if the phone is sitting on the table, it’s distracting, Tanya said. She suggests physically putting the phone away — and of course, turning it to silent to prevent the temptation of checking notifications — for a true disconnection. “People are addicted, and you have to make a conscious choice to spend time with your partner instead of your phone,” Tanya said. This March, tens of thousands of smartphone users will turn off their devices for a full 24 hours and experience what it’s like to be without technology. Tanya said she hopes that brief period will spur them to go without their devices more consistently. “While that one day brings attention, we encourage people to do it regularly, throughout the year,” she said.